Last summer, I made more batches of jam than I can count. I used more than fifty pounds of sugar and filled hundreds of jars (admittedly, I was doing this in part to have plenty to give away at my wedding). Even with all that giving away, I still had a whole lot of leftover jam to consume throughout the year. Now I like jam as much as the next girl (or maybe even more), but that’s a whole lot of jam, particularly when I’m the only eater of sweet spreads in our household. Couple that with the fact that I’m trying not to eat tons of sugar (not that you’d pick up on that fact from reading this site), it means I move through my jam quite slowly. What’s a dedicated preserver to do? Well, I can tell you what this canner’s going to do. She’s going to declare this the summer of fruit butters! Butters cook longer than jams do, meaning that they need less sugar for palatability and can achieve a spreadable texture through the evaporation of liquid. The reduction of sugar does mean that butters don’t last quite as long as jams (sugar is a preservative), but since they’ll have less sugar, I’ll feel better about eating them more regularly, making it possible for me to work my way through my stash at a speedier clip. I do believe everyone will win (and when I say everyone, I mean me). 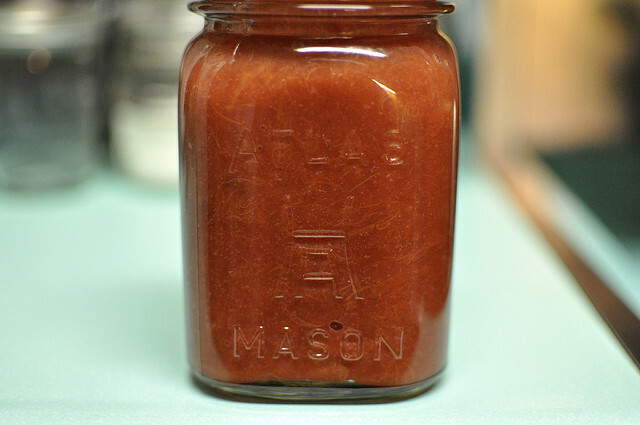 For my first foray down this path, I offer this Orange Rhubarb Butter. It tangy, spreadable and so concentrated in flavor. It would be brilliant on scones or stirred into yogurt. I just have one word of warning for you. It cooks down significantly. I started with six cups of raw ingredients (rhubarb, orange juice and sugar) and ended up with a single pint of product. This is the one downside of making butter instead of jam. But it’s a trade-off I’m willing to make. Combine the three ingredients in a wide pan (I used a 5 1/2 quart Dutch oven) and bring to a simmer. Reduce the temperature to low and let it gently bubble, stirring every five minutes or so. If it’s sticking to the bottom of the pot badly, lower the heat a bit more. Cook like this for at least an hour, until butter has reduced in volume and has turned a deep, rosy color. 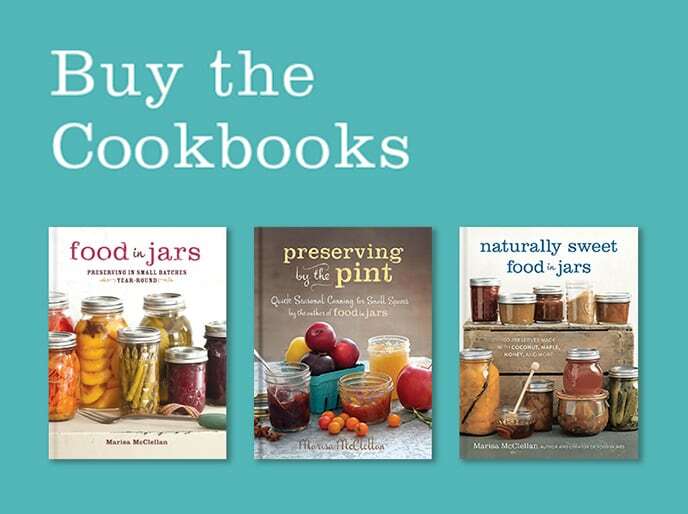 Prepare one pint or two half pint jars. When butter is sufficiently cooked down, ladle it into jars, leaving 1/2 inch headspace. Wipe rims, apply lids and screw on bands. Process in a boiling water canner for fifteen minutes. 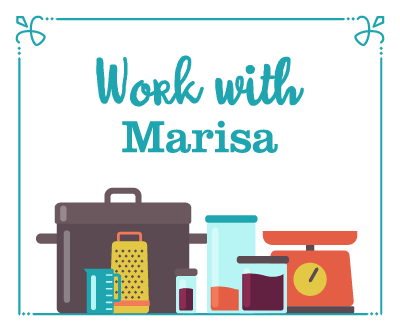 When processing time has elapsed, remove jars from canner and place them on a towel-lined countertop. When jars have cooled enough to handle, remove the rings and test the seals by gently grasping the lids and lifting the jars. If the lids hold fast, your seals are good. 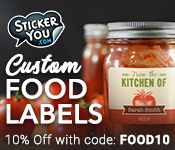 If your jars do not seal, store product in refrigerator and consume within a month. Sealed jars can be stored in a cool, dry place for up to six months. I think of butters for smooth, mellow flavors late in the season like apple and peach. I have never seen anything like this. But it sounds amazing. Such a pretty color, too. this looks really interesting…i’ll try it! Sounds delicious! 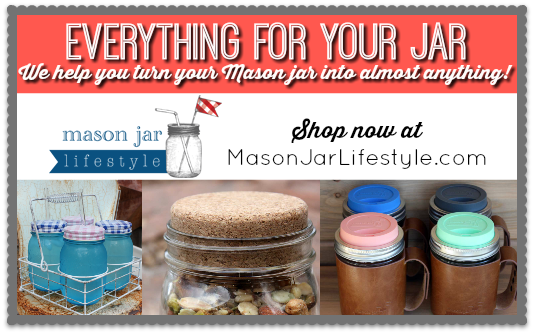 And your jar is gorgeous too! Where did you find that kind? Consider adapting your butters to a crock pot, especially in the dead of summer. It really helps save sweat. 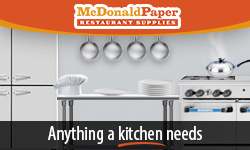 We do apple butter and tomato sauce that way. I’m with Meg. Sounds delicious and your jar is gorgeous. But your knife is even more gorgeous! Where did you get that?! I was admiring the knife too! Ooooh, two of my favourite flavours. This sounds great, I’ll have to try making this! I suppose that one nice thing about there only being one pint is that you feel even LESS guilty about eating it all. Yeah for the summer of butters… I’d follow you anywhere! Looking forward to trying this rhubarb one first…since I can never have enough rhubarb! This sounds delicious and looks so easy. Could I used a non-refined sugar with this? Would maple syrup or brown rice syrup work? Ooo. You’ve got that really nice super red rhubarb. Love it. You know, I don’t make too many butters, but as someone who also has wayyyy too many sweet spreads maybe I should jump the butter train! Yum 🙂 I have to try this as soon as possible. Like, right this minute. I’m really tired of apple butter. It would be just fine with me never to see any of that ever again. But rhubarb orange butter sounds like a great treat. It reminds me of stewed rhubarb, rhubarb jam and pies. Mmmm. This loos stellar. Eugenia, how do you do butters in a crock pot? do you have a blog post about it? Sounds and looks heavenly! I’m also a fan of it having less sugar. I’m not familiar with cooking rhubarb, so I’m surprised at how non-pulpy it turns out. If I wanted to make this and consume immediately would I still have to process? Sorry if a dumb question, still pretty new to canning. For those of you who like the knife, it will be getting a post of its own very shortly. The jar is a vintage one, that I picked up at a flea market. 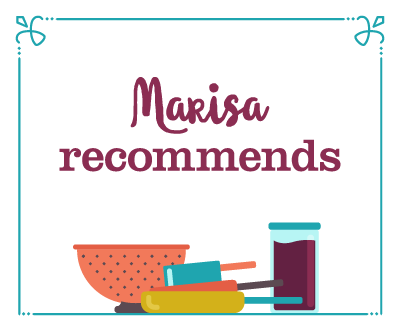 I give brief instructions on how to cook fruit butters in a slow cooker in this post. I didn’t do it with this butter because I was making such a small amount. Eco-Vegan Gal, maple syrup would work in an application like this. I’ve never used brown rice syrup in preserving, so I don’t know how that would do. Kim, you do not have to process this if you plan on using it immediately. Just refrigerate when it’s cool. It will last 3-4 weeks in the fridge. Looks delicious. I have never cooked or baked or done anything with rhubarb before. I just may have to try this. I love making jams but I don’t consume it as much. I don’t normally eat toasts for breakfast, just fruits and yogurt. So I now only buy the plain, un-sweetened yogurt and then mix my own jam in it to make it sweet. That way I’m not comsuming a lot of sugar and I get to eat my own jam. I’ve never made a butter, but I do like the idea of less sugar. 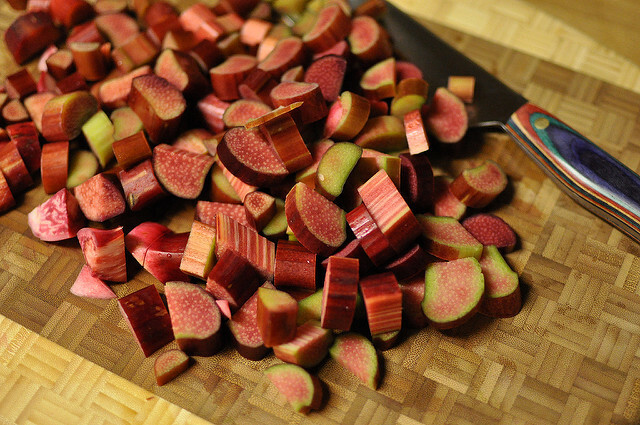 I’m also interested in tasting the difference in flavor after cooking rhubarb down so much. 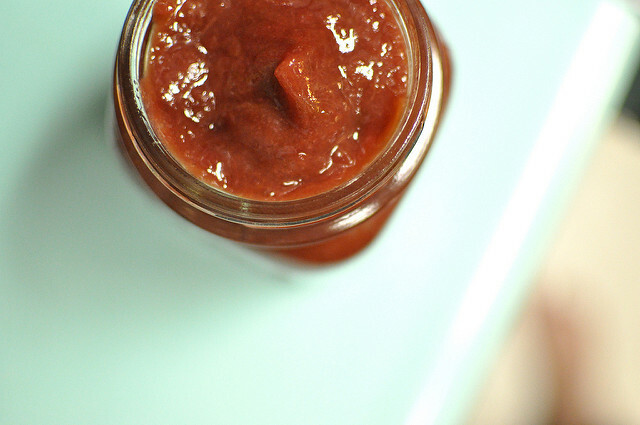 I’m a huge fan of rhubarb and your Mason jar of Orange Rhubarb Butter is so beautiful. I’m inspired. I’m just commenting to state how jealous I am that you own one of those fabulous colorful Fusionwood knives. I saw this recipe this morning, and, when at the grocery store, grabbed up a big bunch of fresh rhubarb, and went home and made the butter. I have to say, if the little taste I got before canning it is any indication, it is the BEST tasting thing I’ve canned to date. I wanted to eat it all! Totally worth it, despite the small yield. Thanks for the recipe!! Wow, this sounds like a cool combination. This recipe is bookmared ;o). Love the jar, LOVE the knife. Can’t wait to see its post. And the butter sounds divine. I like that it’s a simple 1 jar recipe. Sometimes that’s all you need (esp when you’ll can more butters shortly!). Oh this sounds wonderful. 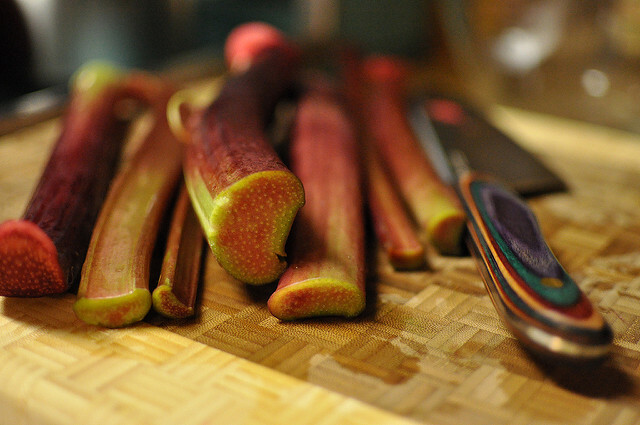 I still have a ton of Rhubarb that I have not used. I am going to try this very soon! Thank you for posting the recipe. i just tried this recipe yesterday and it was soooo good. I might have cooked it down a little bit too much but after adding it to my yogurt this morning, I was very impressed. I made some today! I had 5 cups of rhubarb so I just added 1/4 cup sugar and OJ to mix. YUM. I made this and it was a smashing success! Again, thank you. As my version of this recipe came to the end of its cooking time, it had great flavor but was a pretty tart. I felt it needed something, but not necessarily sugar. I added vanilla extract, which mellowed it a bit. Then I added some powdered ginger. Those additions made the flavor even more amazing, but then there was a powdery aftertaste. I think (at least I hope) that went away after it sat a while, but if I were to make this recipe again I would definitely include fresh ginger earlier in the process. Also, I had to use an immersion blender to reach a butter-like consistency, rather than a stewed rhubarb consistency. All that said, I love this butter! I absolutely love the sticky texture of this, and the flavor is so unexpectedly delightful. Great work! I made this and it was fantastic! I finished it in a week and have my second batch on the stove cooking. Great for peanut butter and orange rhubarb butter sandwiches, and great for dippin g graham crackers into. Two comments: I needed to simmer for about two hours, and I added just a tiny bit of red food coloring to perk up the color. A real winner! This so so fantastic. Tangy and delcious. Mine took a long time to simmer. I finally gave up at 1.5 hours. It was a bit more than a pint. but a real keeper. I have a question… Does this mean orange juice from a carton or orange juice from an orange? I seem to remember that you usually specify fresh squeezed, so I am guessing carton is OK. And I am sure this is just a silly beginner canner question, but can I process this in 2 half pint jars instead of one pint? You can use carton orange juice, but it is better if it is the freshly squeezed variety. And yes, you can process it in two half-pints instead of a single pint. That’s acceptable with just about any canning recipe. Made this today, added some orange zest and when done cooking, put it through a food mill to remove the rhubarb ‘strings’. Maybe it was just my rhubarb, but it is a lot more esthetically pleasing without the stringy texture. Delicious! Have you tried your fruit butters with frozen fruit? I have several huge bags of frozen rhubarb in my freezer (spent a lot of time away from home while it was growing like a weed). I’m wondering if it would work in this recipe. Frozen fruit makes great fruit butters. Anyone have an idea about how long this would take in a crockpot? Please and thank you!! Can this be cooked down in the crock pot or do you suggest stove top? You can certainly do it in a slow cooker! Hi There, I have just moved into a lovely old farmstead complete with it’s own very healthy and beautiful rhubarb patch. 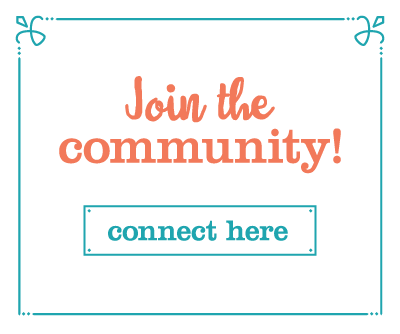 I am going to harvest this year for the first time and I am delighted to find your website! We are also raising bees and I now have fresh honey. I was wondering if honey can be used in the canning process instead of the white sugar? Thank you for your wonderful recipes! Katie, if you search the site, you’ll find a number of honey sweetened recipes! Like I said in the recipe’s note, you can double this preserve, but you may need to increase your cooking time. So I have 2 sick kiddos and don’t want to drag them to the store for OJ, but I have apple juice. Could I substitute?